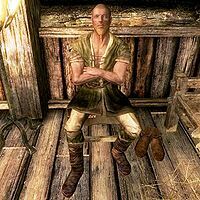 Asbjorn Fire-Tamer is a Nord blacksmith working for Balimund, the owner of the Scorched Hammer in Riften. In the event of Balimund's demise, Asbjorn will assume the role of blacksmith at the Scorched Hammer. Asbjorn sleeps in the southwestern room of the shop every night between midnight and 6am and always starts the day with a two-hour breakfast with Balimund. His workday starts at 8am and, while Balimund works the forge outside, Asbjorn stays inside where he divides his time between working with the various tools in the basement and relaxing in the upstairs area. When the store closes at 8pm Asbjorn takes a two-hour dinner and then strolls around until his bedtime at midnight. If Balimund dies, Asbjorn will take over the shop and the duties outside at the forge between 8am and 8pm but will otherwise keep his old routine. Asbjorn wears a set of farm clothes and a pair of boots. He is equipped with a leveled dagger which can be up to elven quality, and carries a key to the store, as well as a selection of common loot and gold. Asbjorn grew up in the Honorhall Orphanage under the 'care' of Grelod until Balimund, seeing some spark of talent, took him in and began training him in blacksmithing. In his greetings, he will tell you all about it: "Have you met Balimund? I'm his apprentice. He's teaching me all about being a blacksmith. ", "I used to live at the orphanage here in Riften. Grelod said my ma and da left me there when I was a baby... that they didn't want me. ", "Balimund took me in and has been so kind to me. I don't know why, but he thinks I can be a great blacksmith like him. ", "At first I don't know why he picked me. I never even held a hammer in my life! But the first time I picked it up, it just felt right!" and "Folks in town say that Balimund is the greatest blacksmith in all of Tamriel. I hope I can live up to that some day and make him proud of me." Should anything happen to Balimund, Asbjorn will take over the business and use phrases like "Here to purchase some armor or a weapon?" and "How can I help you today?" and bid you farewell with: "Thanks for your business." You can now tell him that he look mighty young for a blacksmith and he will respond: "I was apprenticed to Balimund before he died. He taught me everything I know about forging armor and weapons. Balimund pulled me out of Grelod's orphanage when I was just a child. I don't know what he saw in me, but I was glad to get out of there. I've spent years watching his techniques and learning his tricks. Sadly, I don't think I'll ever be as talented as he was." Esta página foi modificada pela última vez à(s) 12h42min de 4 de junho de 2014.